Xiroku Inc. established a business in Tsukuba in February 2001 after We had succeeded to develop the touch-screen with the CMOS camera system. The CMOS camera system takes images of what is around the finger touching the screen by using the two small cameras placed above the screen and detects the touch-coordinate and the condition of the touch by image processing. Since it allows quick motion and finds very accurate coordinates of several points, the system made such operations possible as not only the traditional touch-screen operation by pressing buttons but also the new touch system of the gesture input operated by multiple fingers. So far, we have shipped out the 15 – 220 inch touch screens mainly to OEM, and are used in weather forecast for example. In recent years, we have manufactured the worlds first pressure sheet sensor by the electromagnetic induction system. It is simply constructed with the cell part vertically intersected by the coil and the metal sheet through the cushion. The electromagnetic coupling changes when the metal sheet, which reacts depending on the pressure, gets close to the cell part, and by detecting the coupling factor, the sheet displays the pressure of each cell independently. It can be applied to a variety of fields such as security systems, welfare, automobiles, and different kinds of equipment. 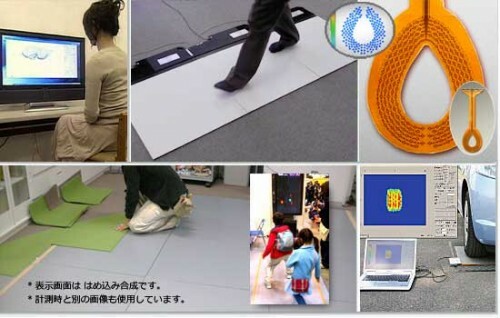 In addition, it has actually been in use as the input device for game machines for business use and as a product planted on a large floor. Even though the pressure distributing sheet sensor is hardware to control advanced equipment, you can intuitively use it even without reading the manual. It is a man-machine interface that you can use without feeling out of place with it. We have been developing such interfaces actively. Manufacture and Wholesale Meat Products – S Foods Inc.